One of these days I’ll share a recipe that is healthy, full of fresh veggies, and oh so delicious. But until that day comes I guess you’ll have to live with the tasty baked treats that I come up with and truth be told … my family likes the baked goodies a lot better than the veggie dishes. This week I had a great idea after seeing a picture of homemade ricotta that my brother posted on Instagram and immediately made my list and started planning out what I was going to do with it. But I got stuck. I couldn’t decide if I wanted sweet or savory and didn’t make it even though I have the majority of the ingredients waiting in the fridge. So instead of the ricotta I made bread. I may have mentioned a time or two that I love baking and I’ve been wanting to try my hand at Challah. It always looks so pretty sitting on the shelves at the store and I’ve heard such wonderful things about it that I knew that I had to make it. I won’t lie… it took a while to make the bread. It wasn’t a quick bread by any means but it was definitely worth all the hard work and there is something about actually working with the dough. Kneading it, working it from something soft and mushy into something smooth and pliable and I just love the smell of the yeasty dough. Place the yeast, honey and warm water in a mixing bowl. Stir and let stand for about 10 minutes, until creamy and foamy. If you're using a stand mixer make sure you have the dough hook attached and add the flour one cup at a time until it forms a soft dough. Place the dough on a well-floured surface and knead until the dough becomes smooth and elastic, about 5 minutes. I tried to let my mixer do the kneading but it didn't seem to like it all that much so I pulled it out and did it by hand. Place the dough in a large, well-greased bowl, then flip the dough over to coat with oil. Cover with plastic wrap and then with a clean towel and let it stand in a warm place for about 1 hour, or until doubled in size. Punch the dough down and let it rise again for about 30 minutes or so. 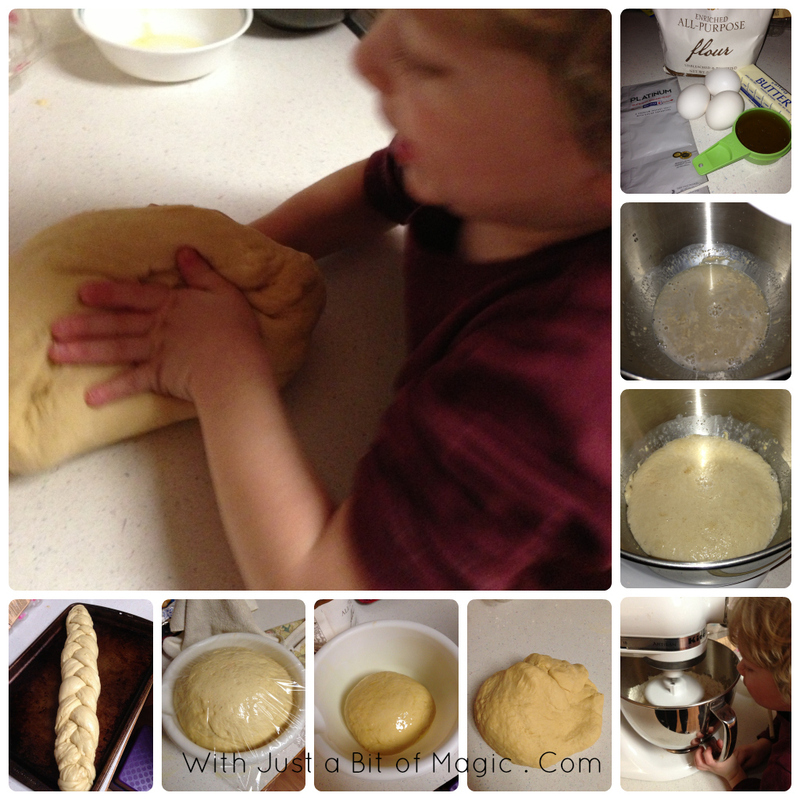 At this point you can place to dough in to greased loaf pans or you can divide the dough into 3 equal pieces and braid. Brush the braid with the beaten egg and bake for 30 - 40 minutes. About half way through baking brush the bread with the egg again to get into all of the creases and spaces that opened up more from baking. I will say that when I braided the dough it looked amazing and then once it was done rising it didn’t look so good anymore. I’m not sure what happened but it looked like it was pulling apart in places. I pinched some of it back together the best that I could and just went with it because it looked good enough for my first try. Andrew had to get in on the kneading action too. It never fails that he’ll show up every single time I’m doing something in the kitchen because he wants to help. Sometimes he’s helpful… but only sometimes. The bread turned out amazingly well and everyone loved it. I’m planning different things that I can do with the bread… french toast & bread pudding came to mind first. 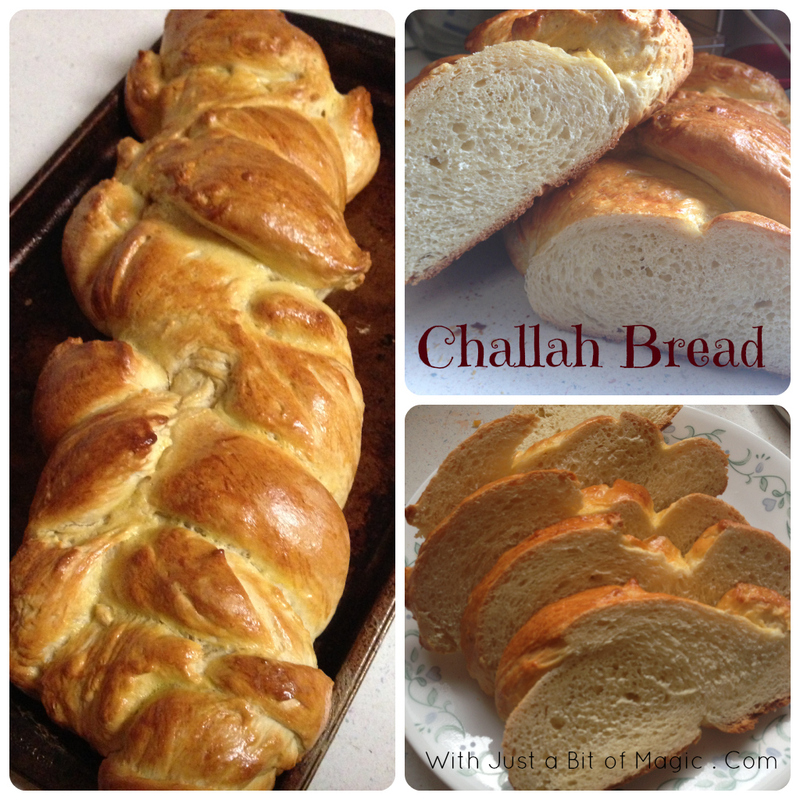 So, do you have any suggestions for what I can do with leftover Challah bread?